here we have a nice lot of 7 watches for Sale. 1.Seiko Padi + 3 bands .Full set, B/P. sticker price still on the back...44mm. 2.Movado Acvatic 60 s Pink gold plated,manual wind 35mm.Excellent general condition for its age and Movado caliber runs very fine and winds smooth. 3.Corniche Courchevel,Blue dial.Caliber Quartz Myota. Please note that white points visible are only dust. 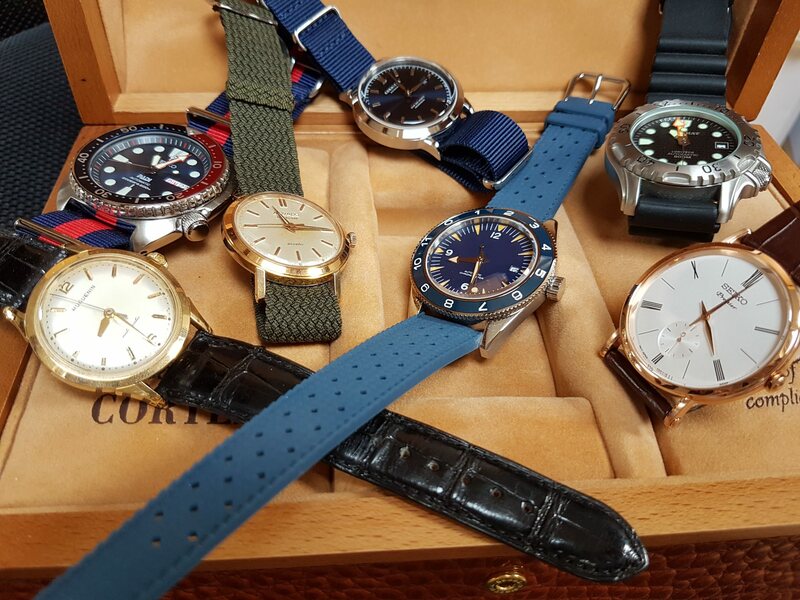 I will let go this nice bunch of watches for 1100 eur as 1 LOT + shipping ... if wanted only 1 piece price are noted. Bank wire or Paypal + 5 %. Shipping by Colissimo International Insured Included.